The floral theme challenge filled the gallery with 172 beauties covering all styles!! Truly a feast for the eyes :-) Great work everyone. 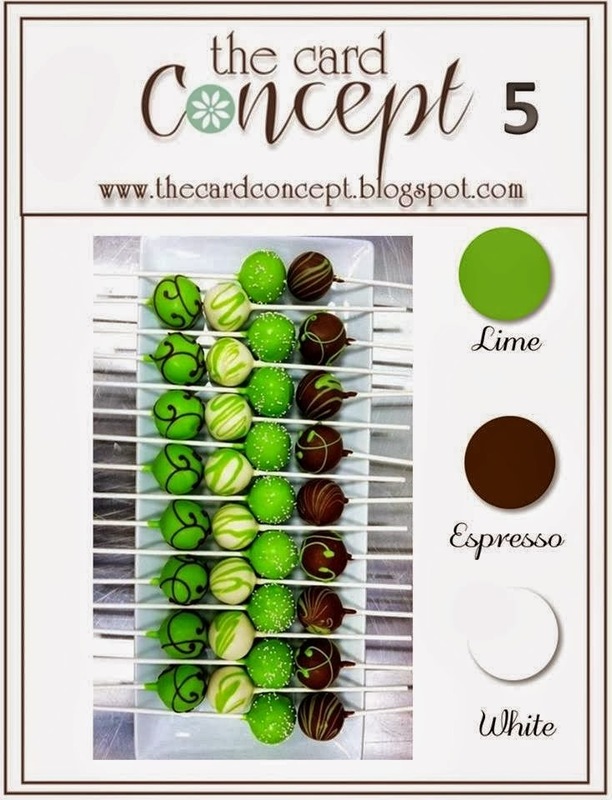 This week at The Card Concept we are really changing gear, have a look at the challenge photo. Lime, espresso and white......not only does it get the saliva running (if you have a sweet tooth), it will also inspire you to get those fingers inky. Enjoy! This week I have been a little taken up with my new Silhouette Cameo. I have had it for two weeks but it wasn't until this week that I had a day free to learn how to use it. By the end of the day I was able to print and cut, and trace and cut my own designs.....sooooo exciting. There are such wonderful tutorials available on using the machine, one of my favorites is adding fancy edges to a circle using dingbats, I love my dingbat circles. Check out Kay's blog . The numbers were the first project on the machine. I had saved this sheet of numbers some time ago. I used them to practice my first trace and cut. Perfect! They were blue gradient filled, but a swipe or two of Colorbox green pigment ink fixed that. These numbers were the starting point for my card. For the background, I stenciled a little moulding paste, coloured with green ink, through a gorgeous new stencil I have just purchased. It's from The Crafter's Workshop - Mini Sketch Grid. It is so delicate, I love it's broken irregular design. Their fabulous designs can be seen here. I have used Spellbinders Banner Basics 3 for the banner, Clearly Besotted 'You Are' stamp set for the sentiments and Prima wood for the Ampersand. I have seen photos on Facebook showing huge amounts of snow in some areas of the US, I just can't imagine how those affected are coping. Do have a safe and creative week. So very cool and I love that you did your own design. Oh how I wish I had a machine like that! What a wonderful card for a 50th birthday! I think you're going to have a lot of fun with that machine! Fabulous and fun elements on your card....so in love with your molding paste background and the fluffy/puffy "50"! What a fun and fabulous card, Karen! And congrats on your new Cameo - aren't they fun! Your card is totally wonderful Karen - you've used the challenge colours to perfection! Wow you took to that Silhouette like a PRO! I may need some pointers, I haven't gotten into tracing my own designs yet! The 50 is awesome, the first thing that pops into my head is "groovy"! Oh this is so fabulous Karen!! I love the big green 50!! I use my Silhouette almost every single day. I love that machine! You've done a wonderful job on your first project! This card is amazing! Love seeing all of the elements you included here, velum, sequins, stitching and that 50... Wow, a real beauty! What a fun design, Karen! Your '50' has such a fun, retro feel to it and I love how you grounded all of the elements with the banners. Awesome project! This card would make turning 50 so much easier! Love that you have used your Silhouette to make it...I love mine! Looking forward to lots more projects from you using it. What a fun card,Karen! WOW! I love your design,the numbers are awesome!! And i love the background!!! Karen what a fun card! You did a great job with the numbers anyone would love this! I remember when Cathy W. Got her Silhouette she spent a lot of time learning it as well but loves it! So glad you are finding joy using that fabulous machine called the Silhouette!